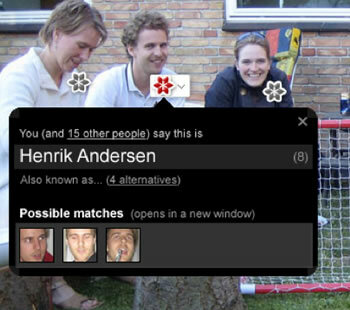 Polar Rose is a new search engine that will allow you to find anyone in any photo on any site. 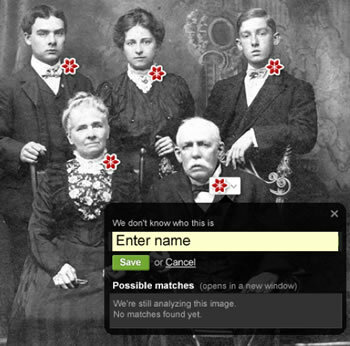 The Polar Rose plug-in helps build a database of identified people by aggregating user input. Polar Rose starts by identifying the parts of an image that looks like a person. In the picture above, there are five parts that are identified as people's faces. If a person's face is not in the database, the application asks if you know that person. If the Polar Rose database knows the face, or if it has any possible matches, the plug-in will display it on the picture, and ask for your agreement or other input. Polar Rose is a computer vision research project at the Universities of Lund and Malmö (Sweden). The goal of the 7 person team is to provide an application that will make images as searchable as text documents are today. Visit the Polar Rose website.